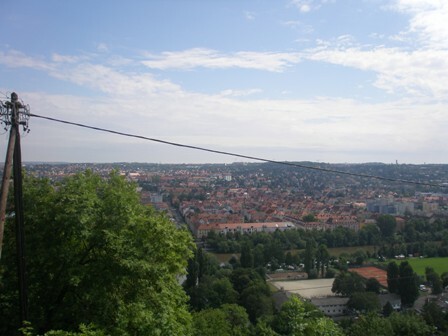 When I recently visited my home town Trier, I also had the chance to explore mother nature in nearby Schoden, Saar. It was a grey and rainy November day as we like it. The weather makes you wish for a hot tea in a warm place, maybe near a window with a view. Or a walk through the steep vineyards in the Saar valley. 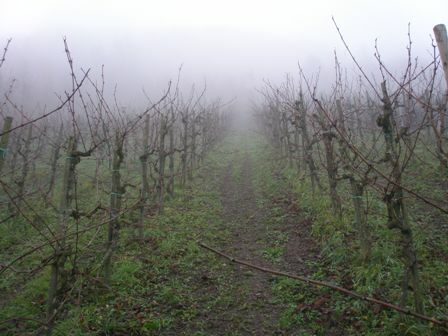 Some of the vineyards were already pruned. One could spot pruners here and there, alone or in small groups. 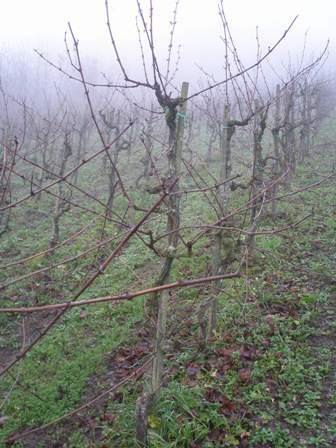 Please note the pruning style of these vines. November is a good time to visit wine regions. It is less crowded and people have time for a yarn. 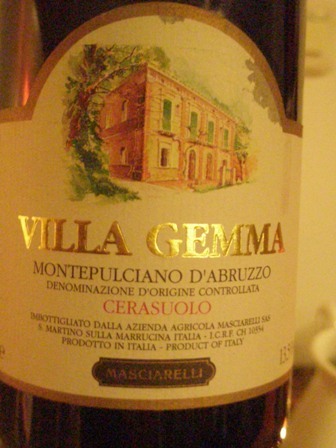 Another very nice wine which I tasted recently is the ‘2007 Villa Gemma Montepulciano d’Abruzzo’ by Masciarelli. More than twenty years, Gianni Masciarelli started to produce grapes and wine from a 2.5 ha vineyard which has “grown” to more than 220 ha under vines today. Also the yield level with about 10 tonnes/ha is not particularly low. However, I liked this fruity wine which shows the characteristic of the Montepulciano grape. The wine is round and smooth with lots of black fruit but also vanilla and spicy notes. It also went very well with the Asian food we had it with. In the tropics we tend to drink wine young (very young indeed), because storage can be a problem. It is a pity that Gianni died in 2008 at the tender age of only 53. Try is wine with Asian cuisine, you will not regret it. 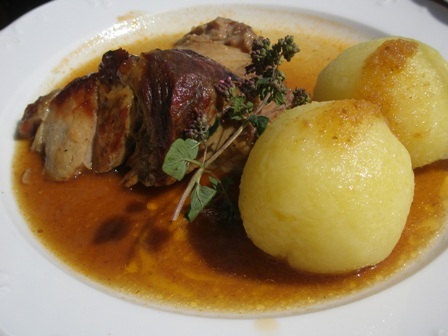 A great place to eat and be merry in the town of Würzburg in Franconia is “Der Schützenhof“, a German country inn with a long and strong tradition. The views from it’s terrace are spectacular. You sit above the roofs of the historical city, so to say. 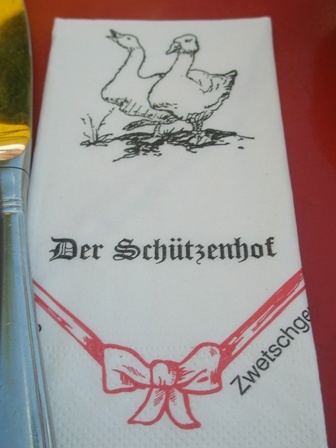 The “Schützenhof” is not only famous for its views, but for it’s traditional German cuisine as well. 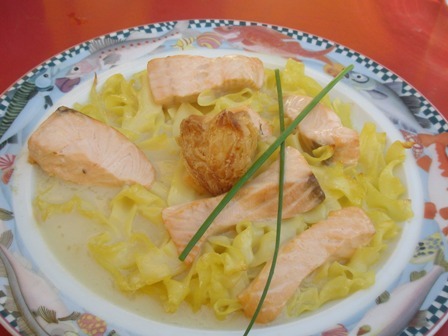 I just love these tasty, robust, rural dishes made as if grandma had prepared them herself. Look at the pictures below, are they not mouthwatering? 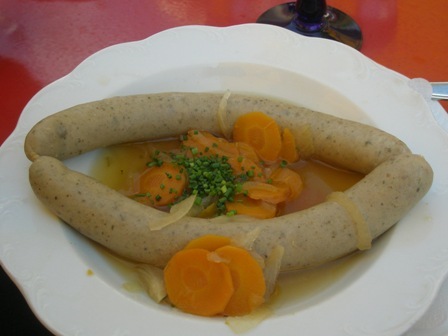 The food is just excellent, German country cuisine at it’s best. I ordered the house wine, a local drop made from the Silvaner grape. My friends Romy and Friedel prefer other grapes for instance “Gutedel”, also known as Chasselas grape in France. But they also like Mueller-Thurgau, Pinot Blanc and Gris, Kernen etc. With about 6,000 ha under vines Franconia produces excellent wines. 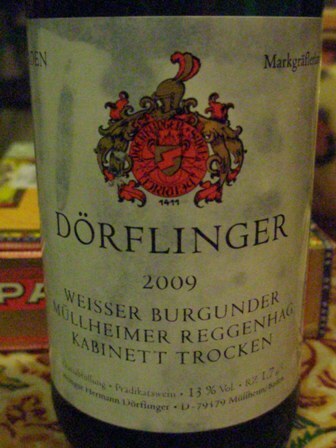 It is famous for it’s dry Silvaner wines bottled in the so called “Bocksbeutel”, a rounded and flattened bottle type. 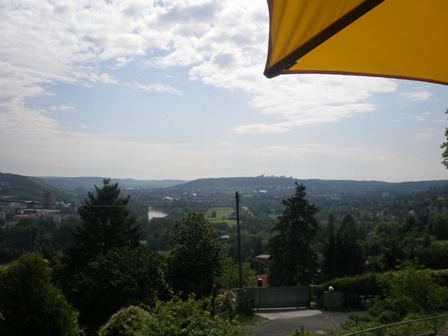 Franconia is a wine land (or German wine region) which wine enthusiast should explore. You’ll find amazing drops. Check it out. 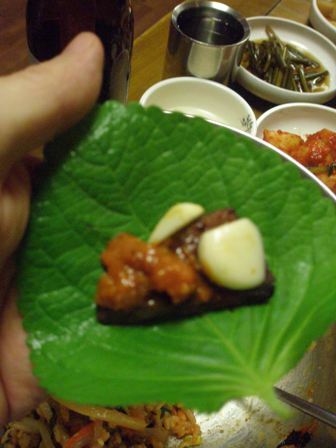 I am back to my recent Korean experience. Apart from the fine dining at expensive restaurants, I had also the chance of “home style cooking kind of food”. 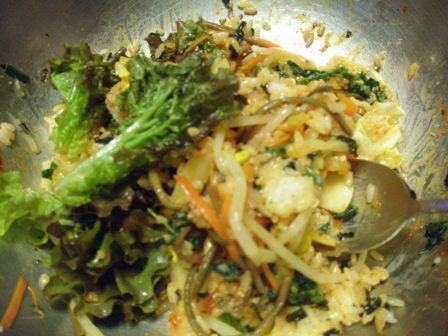 One of them is Bibimbap (비빔밥), which literally means mixed rice. The photos below show you what you can expect. Frankly speaking I was very apprehensive when I saw what was put in front of me. The metal bowl put me right off. But, boy, this was a delicious meal, I tell you. 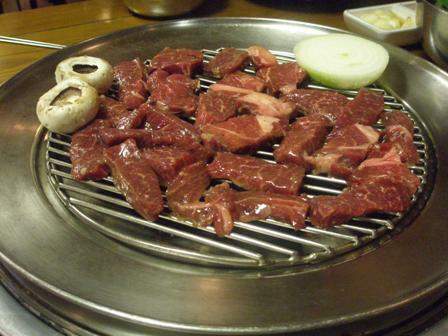 You should definitely try it, if you visit Korea. 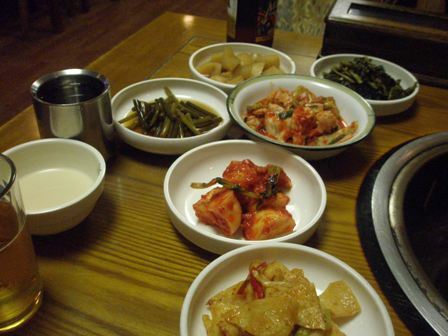 Every Korean meal starts with various kind of Kimchi, which are usually very tasty. 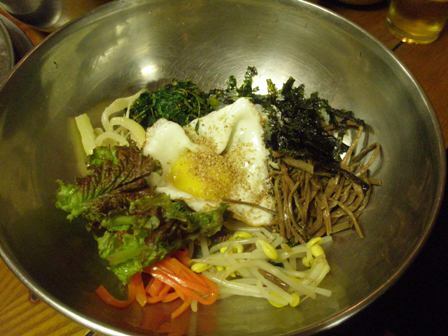 The metal bowl for the Bibimbap was next. We mixed everything right through. It was a strange feeling, I must say. 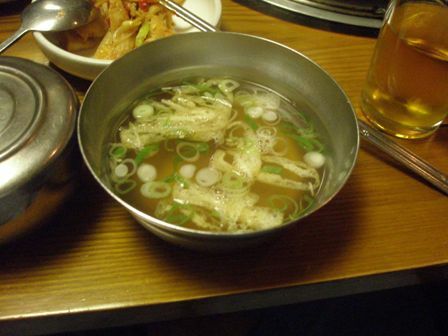 The next dish was a soup. The beef was very tender. 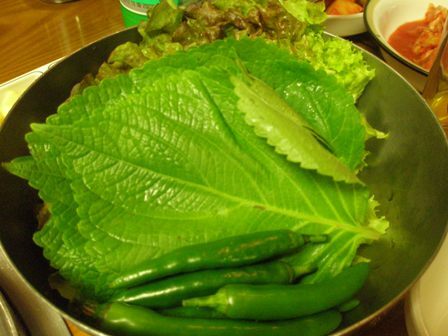 We wrapped it the Korean way in sesame leaves with garlic and chili paste. Just the right stuff for someone like me whose taste buds have become used to hot dishes. 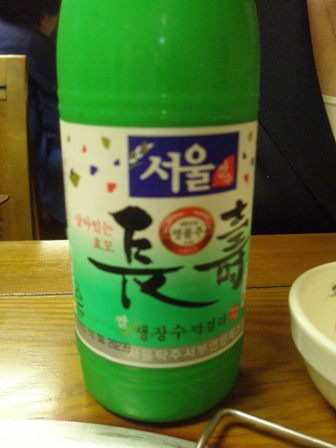 We washed the food down with Korean beer and “makgeolli” (막걸리) the fermented drink on a rice-wheat basis and low alcohol (max. 7%). 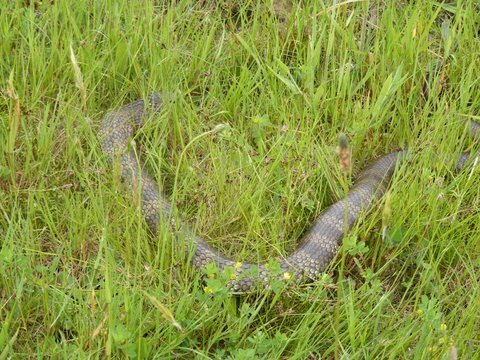 Today, my brother in law, Michael, send me some photos from our vineyard. 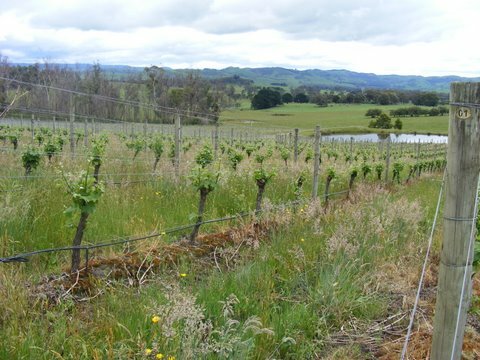 The above one depicts our 2 1/2 acres of Sauvignon Blanc which have been mothballed for the coming season. It look a bit wild. I will slash the grass in a few weeks. 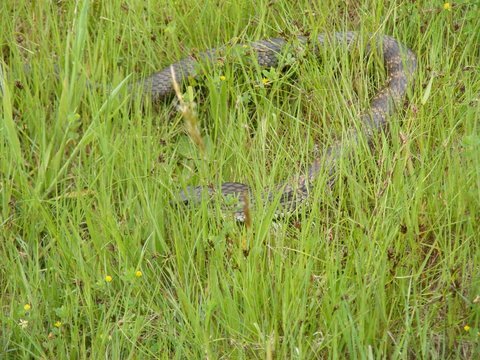 Michael also met a snake in the grass. 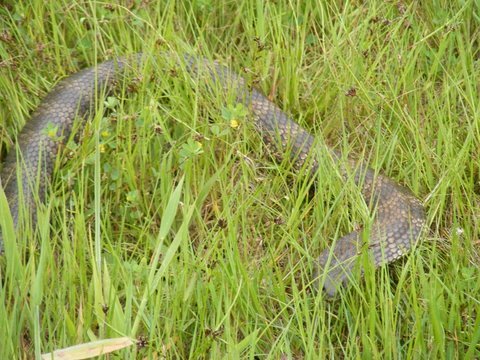 Is it a black or a tiger snake? Anyway, they are all poisenous. Thanks Michael for the great photos. 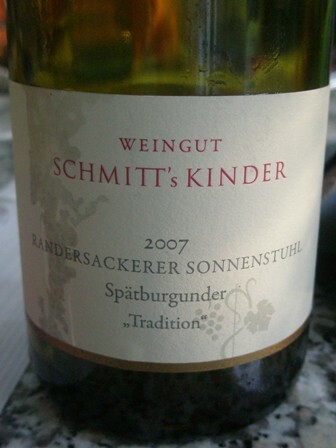 One of the best Franconia wineries is Schmitt’s Kinder in Randersacker, a lovely village of about 3,500 people along the Main river, about 30 minutes from Wuerzburg, the capital city of Lower Franconia. We have visited Randersacker in 2008 and cultivate fond memories of this (much too short) visit. The name “Schmitt’s Kinder” (in English Schmitt’s children) goes back to 1910 when the children of the vintner (Schmitt) did not, as is the custom in Lower Franconia, divide the property after the fathers death among the siblings, but instead opted to jointly cultivate the land. The winery is currently under the management of the 10th generation of vintners: Karl Martin and Renate Marie Schmitt. 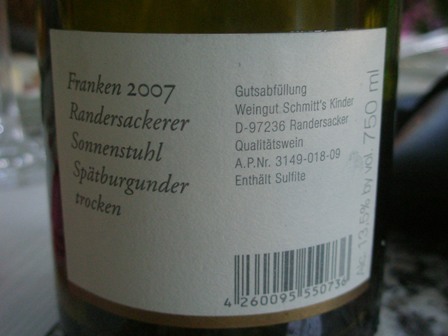 The total area under vines is bout 14 ha in the locations “Randersackerer Sonnenstuhl”, “Marsberg”, “Teufelskeller”, “Pfülben” and “Ewig Leben”. 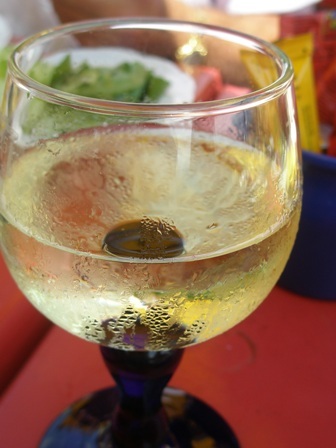 Main variety is Silvaner, followed by Riesling, Mueller-Thurgau, Scheurebe, Pinot Blanc, Bacchus, Domina and Pinot Noir. The ‘2004 Randersackerer Sonnenstuhl Pinot Noir’ won the 2006 Pinot Noir Cup for best Pinot Noir wine of the world!!!! Can you imagine? That’s just great, a German Pinot Noir beating the best of France and Australia. 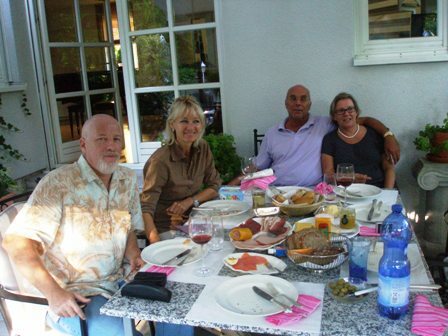 Our friends Romy and Friedel Engisch in Wuerzburg offered exactly that wine when we visited last August. I tell you also the 2007 vintage of this Pinot Noir is first class. Amazing what Pinot Noir wines Germany can produce. If you have the opportunity to get your hands on a bottle of this wine, do so immediately. Total production is quite limited but the price level is very reasonable. You are currently browsing the The Man from Mosel River blog archives for November, 2010.